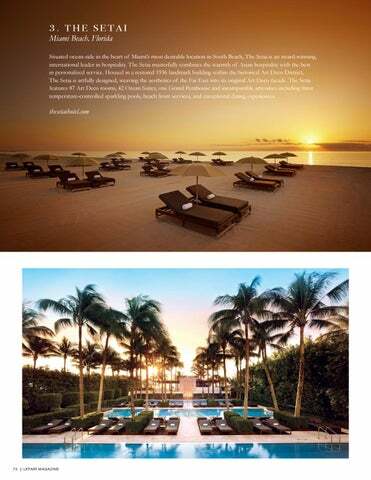 Situated ocean-side in the heart of Miamiâ&#x20AC;&#x2122;s most desirable location in South Beach, The Setai is an award-winning, international leader in hospitality. The Setai masterfully combines the warmth of Asian hospitality with the best in personalized service. Housed in a restored 1936 landmark building within the historical Art Deco District, The Setai is artfully designed, weaving the aesthetics of the Far East into its original Art Deco facade. The Setai features 87 Art Deco rooms, 42 Ocean Suites, one Grand Penthouse and incomparable amenities including three temperature-controlled sparkling pools, beach front services, and exceptional dining experiences.